Modifying the color and shade of your headlights is probably one of the oldest and most popular ways to customize the look and feel of your car or truck and has a history that reaches all the back to World War II. Because of their wartime origins most headlight modifications had to do with light discipline and so were designed to reduce the amount of light passing through the lens and which could be seen from above by air reconnaissance. At the time there were really only two ways to blackout your headlights: either by placing a grille or ventshade in front of it or by painting the lens. This later method of painting one's headlights also became know as "smoking" due to the gray or charcoal appearance of the light after it was painted. Is there a difference between smoke & tint? If there was any confusion about the provenance of the term "smoked headlights" I think our quick, historical explanation has now firmly put it to rest. The term "headlight tint," however, shouldn't be confusing to anyone due to the fact that almost everyone in the whorl knows what window tinting is. In essence, the term is primarily used to describe tint that is laid on a headlight rather than sprayed on although the terms have become interchangeable in recent years. Evidence of this trend can be found by doing a quick Google search where a query for the term "smoke headlight" will return results from Lamin-X, Headlight Armor and other companies that sell headlight tint films and precut kits. 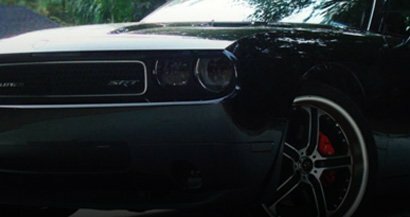 How is Headlight Tint Different from Window Tint? Now that we've established the difference, or lack of one, between smoked headlights and tinted headlights it makes sense to ask: what's the difference between headlight tint and window tint? In this case there really is a difference and it's a big one. You see, professional grade headlight films made by companies like Rtint, Lamin-X, Husky, Xpel and others are made from optically-clear, thermoformable vinyl. Window tint is made of polyurethane which can be milled to a thickness of less than vinyl and which shrinks when heated. The fact that it shrinks rather than stretches when heated and its thinness mean that it does not perform well on compound curves that are common on today's headlights. Worse yet, if an installer is successful in applying window tint to headlight lens the results can often times be as permanent as painting. At Rvinyl we have heard stories of customers who have had their lights tinted with window film and now cannot remove it without destroying the lenses. In the final analysis, window tint and headlight tint may be similar in theory in that the both use a film to darken or change the color of the substrate but that is where the similarities end. Be smart when you're looking for smoke or tint your headlights and trust a reputable brand to provide you with a film that will not damage your lights. Still have questions? Contact us today at sales@rvinyl.com and we'll be happy to help!